I usually try to spread medical appointments throughout the year, but somehow I’ve had a bunch land in November! Go figure. At any rate, having all these appointments to make, and knowing that cold and flu season is gearing up, makes me really appreciate all the people who work in the medical field. So today, I would like to share a quick “thanks” to some of the offices my family sees. I love seeing my girls’ pediatrician! My youngest is going to her 18 month appointment next week (at 19 months, that’s not too bad for the second-born), and I’m actually looking forward to it. Every time I go, the doctor makes me feel like I’m super mom and says all kinds of great things about mom’s intuition. He even does a fabulous job of feigning excitement over meeting various milestones. Yup, that’s a winner. I respect his opinion, make changes to diet and such based on his recommendation, and tend to arrive with my list of questions to ask. I see a lot of talk on social media about “good” pediatricians, and sadly, I feel many of these doctors do not get the respect they deserve because patients often come in ready to make their agenda known. It is my belief that if we show respect to the medical field, they will listen to our concerns while providing fantastic medical care. We can respectfully share our opinions, and they will respectfully share theirs. We are a team on the same side. These guys are amazing. My daughter actually looks forward to going to the dentist! 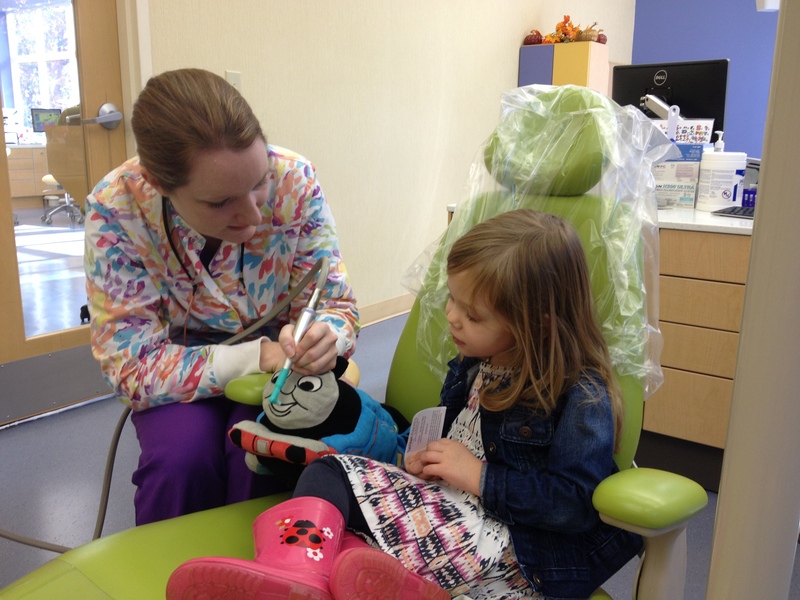 Her very first appointment was at 2 years old, and everyone was so patient with her and her concerns. To help alleviate her fears, they let me hold her in my lap. They sang songs and talked about “tickling” her teeth. She was able to hold a huge stuffed Thomas the Train and helped clean and count his teeth. She has graduated to the big chair, but requests Thomas every time we go for a visit! For older children, the office is packed with iPads to keep them entertained while they wait. My daughter always leaves with a balloon, stickers, and something out of the prize drawer. It’s like we went to a fair or something. As a mom, it is a blessing to know that when I tell my daughter she has a dentist appointment, she will start to get excited about it. This is my doctor. I chose her office because I knew her from church and we were in the same small group for a long time. I’ve never been a fan of doctor’s appointments, but she makes all the difference. When I go, I am guaranteed a huge hug as we catch up on small details of our lives. I love her demeanor. She is calm, relaxed, and goes with the flow. In pregnancy, I always came with a huge list of questions. Even if my questions were silly, she was happy to answer them and I always left at peace. Doctors who take the time to help you understand are golden. She has always been willing to listen to me, and I have always been glad to hear her medical opinion. I haven’t even mentioned eye doctors, or my own dentist, or nurses, or family doctors… Whoever you are and whatever you do, I just want to say thank you for the years you devoted to studying your profession. Thank you for caring for your patients and for doing what you do. You are appreciated! Amanda, you are so thoughtful. I too am so thankful for my doctors through my path of healing. I have seen God’s hand in directing me through the journey of healing. I don’t know why I had to go through so may paths, but I know it was all by design. I go to two next week in Hickory. I just wish I could find doctors closer, but so far God has not directed me yet so in His time! I love that we have such valuable resources whose job is to help us!